The slowdown in the London market, along with a new generation of Russians and former Soviet Union nationals with a fresh maturity and willingness to diversify, is leading many away from the haphazard residential investment plays of a few years ago. While parking funds in shiny London developments – both in terms of early equity investment to get them built and the actual purchasing of units – still takes place, the ‘asset class cachet’ is no longer the driving factor. We are seeing the end of snobbery – if returns are better on student housing or something distinctly unsexy then that is where funds will go. This is in stark contrast to a few years ago when ‘if it’s not in Knightsbridge, don’t show me it’ was the prevailing attitude. As testament to this, 2018 saw the closing of significant commercial investment deals in hotels in Manchester, business parks in the south and student housing in Birmingham, with investors enjoying yields of up to 8%. This year already looks as though it will follow suit as we see money continue to move into the regions and away from the bright lights of the capital. However, London’s time is not up just yet, despite what the mainstream media might say. The capital’s fundamental traits of legal stability and cultural diversity as well as its reputation as ‘the’ English-speaking business hub are too strong and long-standing for it to be overtaken for long. The fluctuation of the pound – favourable to foreign investors – is adding to that, but don’t expect it to last forever. As for the big B (Brexit), while the uncertainty is unsettling at present, from an investment perspective the fundamentals will always be attractive. On a political level, through unexplained wealth orders and other means, we are seeing an increased clampdown on those involved in economic corruption, which historically has been – at least partially – parked in prime central London properties. This is, of course, a good thing. However, it is important that the government and the public make a clear distinction regarding the UK’s current and inbound Russian population between those who do things the right way and those who don’t. The vast majority are not oligarchs but hard-working, honest investors whose public persona is often sullied by the few. The government runs the risk of a self-inflicted own goal if the entire Russian demographic begins to feel unwelcome, which would result in a decline not only in the demand for property but also in the rest of the investment they bring into the economy. Let’s face it; there are plenty of other attractive global cities where investment can flourish. It’s going to be an interesting year. 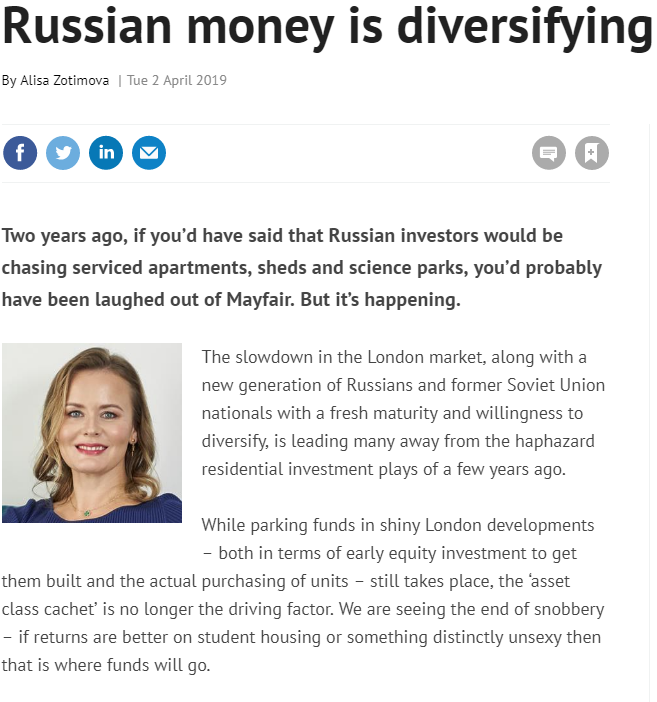 You might be surprised where you see Russian-speaking investors popping up, both in terms of location and asset class.